All about the beautiful Phi Phi Islands Dive Sites. The Phi Phi Islands are an archipelago made of 6 Islands located approximately 50 Km / 30 Miles east of Phuket. Phi Phi Don Island is the main and biggest one as well as the only inhabited island in the archipelago, where all the hotels, bars and restaurants are situated. South from there is Phi Phi Leh Island, the second biggest, which is part of the National Marine Park and therefore uninhabited offering several nice dive sites. Further south from there is a couple of small limestone islets called Koh Bida Nai and Koh Bida Nok, both offering excellent Phi Phi Islands dive sites. North of Phi Phi Don lay two more islands named Bamboo and Mosquito Islands. The first has very shallow waters not suitable for diving, while Mosquito offers very good diving although the site is currently closed for marine life conservation reasons. Koh Bida Nok is one of the two limestone islets at the south end of Phi Phi Archipelago, and one of the best Phi Phi Islands dive sites. The underwater scenery is very diverse ranging from shallow flat reefs to slopy reefs and walls, with a huge amount of different fish, corals and marine life in general When diving Koh Bida Nok early in the morning before it gets busy, as we do on MV Giamani, it’s almost guaranteed to encounter Black Tip Reef Sharks. 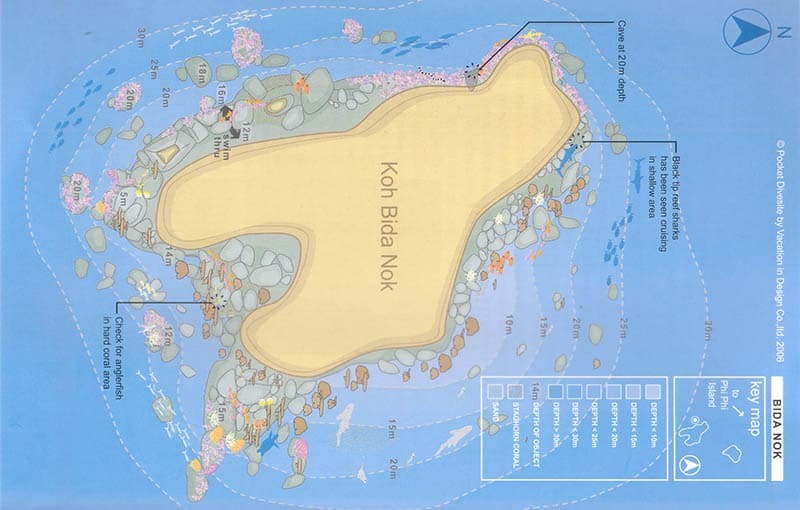 Koh Bida Nai is another small limestone islet situated right next to Koh Bida Nok. Together with its “sister” island it’s considered one of the best Phi Phi Islands dive sites. The current and visibility conditions can be very variable depending on the day, and when they are ideal Koh Bida Nai provides an unforgettable diving experience. 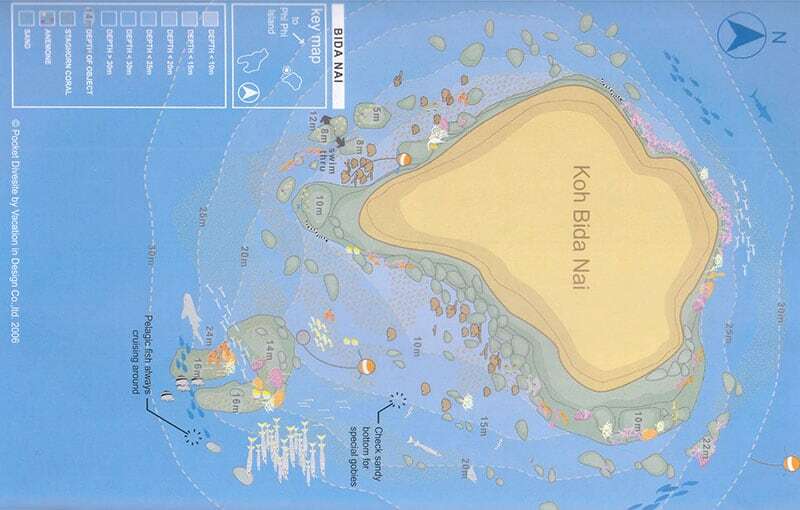 Hin Bida is a partially submerged pinnacle located in the open sea about 3.5 miles southeast of Koh Bida Nok / Nai. 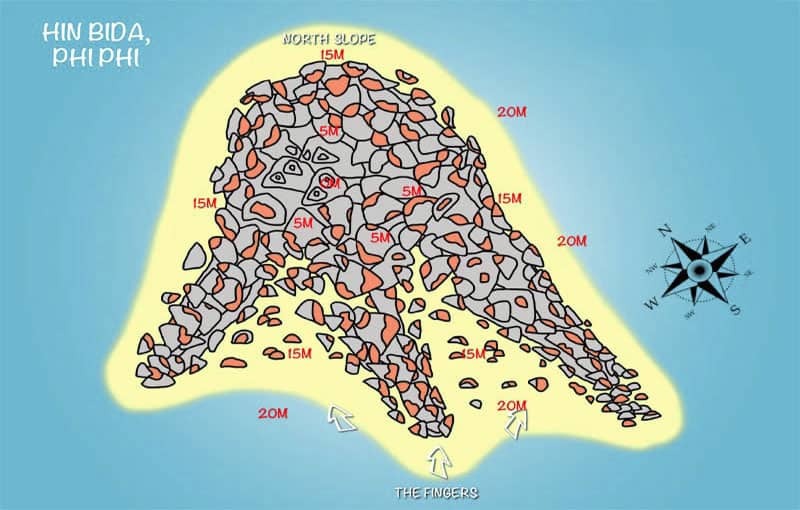 The rock barely breaks the surface during low tide and disappears underwater at high tide. 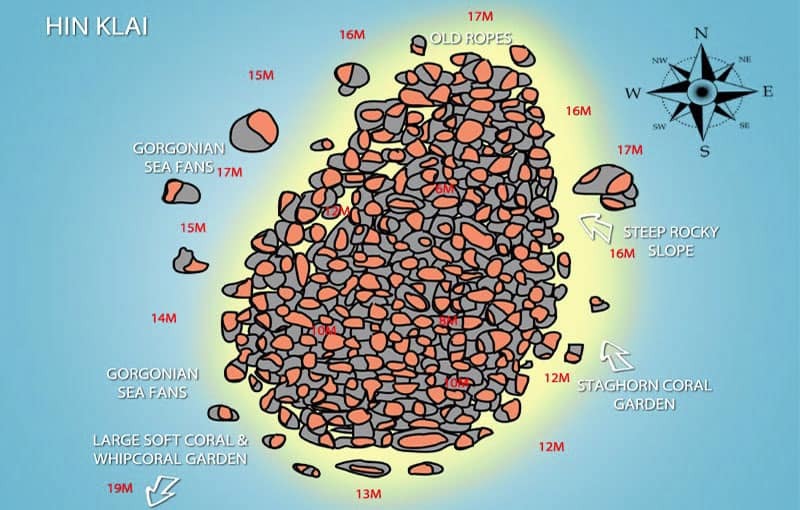 The sloping reef is covered by healthy hard and soft corals with abundant marine life. On the sandy flat bottom around the pinnacle is possible to spot Leopard Sharks. Hin Klai, which in Thai means “the far rock”, is a completely submerged pinnacle situated about 3 miles east of Phi Phi Leh Island in the open sea. The pinnacle is relatively small and due to its exposure to currents it’s usually best to dive during slack tide. Hin Klai is one of our favorite Phi Phi Islands Dive Sites as the amount of pristine soft and hard coral is impressive, and it’s often possible to get face to face with Leopard Sharks. 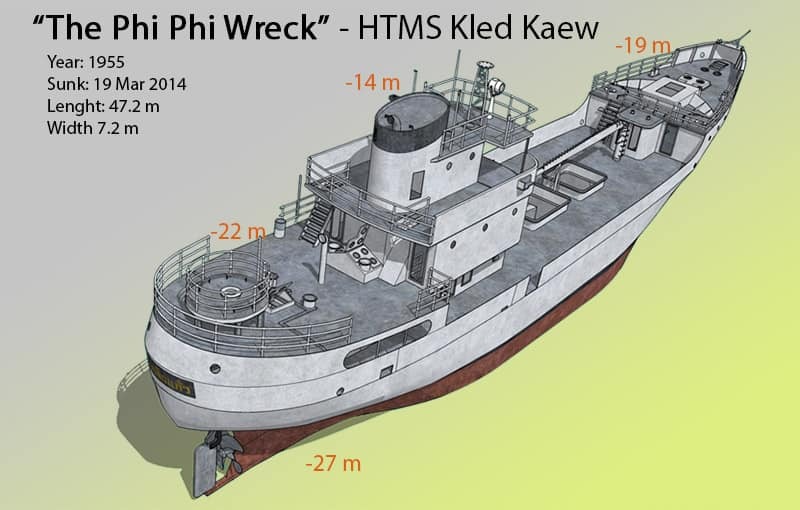 HKMS Klad Kaew, AKA “The Phi Phi Wreck”, was originally a Norwegian Navy Ship built in 1955 and later donated to the Royal Thai Navy. In 2014, at the end of its life, the Thai government decided to sink it right off the east coast of Phi Phi Leh Island to make a new dive site. The operation definitely succeeded, as it’s now one of the best Phi Phi Islands dive sites. Viking Bay is an easy Phi Phi dive site located along the east coast of Phi Phi Leh Island, right next to the popular Viking Cave. 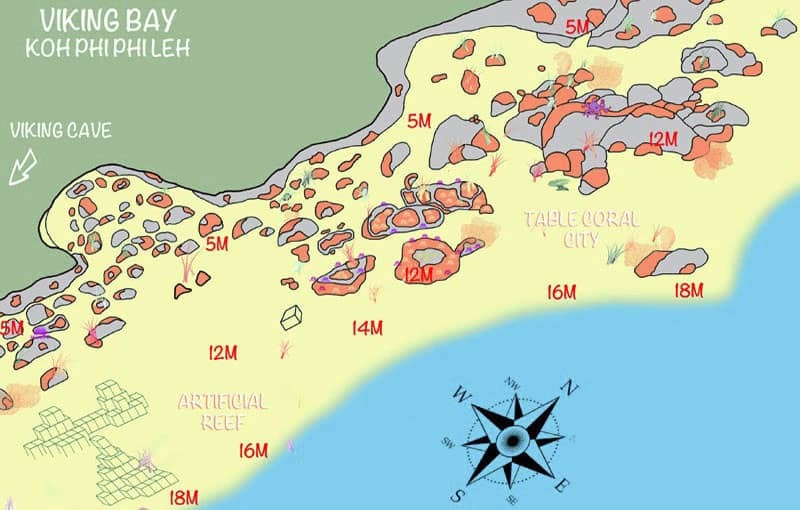 The site splits between a large artificial reef laying on a sandy bottom and a natural reef with lively marine life. The shallow depth and protection from currents make Viking Bay a perfect Phi Phi Islands dive site for sunset dives and training dives. Pileh Wall dive site stretches along Phi Phi Leh Island’s east coast, right south of the entrance of the famous Pileh Lagoon. It’s an easy and relaxed dive thanks to the relatively shallow depth and mild currents, for the same reason very suitable for our sunset dives on MV Giamani. 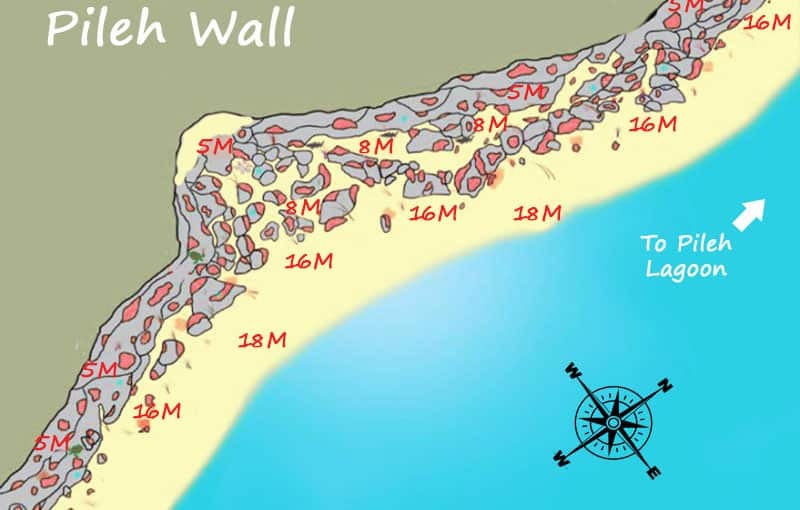 The wall is covered by nice hard & soft corals, and the colourful reef fish are abundant.